I give this a 4 rating mainly because the fish are so nice this year. Many are 16-17 inches and pretty heavy too. Fished the Mossyrock end of the lake about 30-40 feet down. Slow troll at around 1mph. Used wiggle hoochies behind a sling blade. Corn and shrimp. Two great things about fishing Riffe. 1- it's 80 degrees not 100 like eastern Washington. 2- I caught three species. Coho, Chinook and a nice trout. 1- the ramp! Long backdown to waters edge. It's long, rough, narrow and pretty busy. No dock and limited good beaching area. 2- lots of small, 6-8 inch silvers. View other reports from Fisheries24. Nice fish. 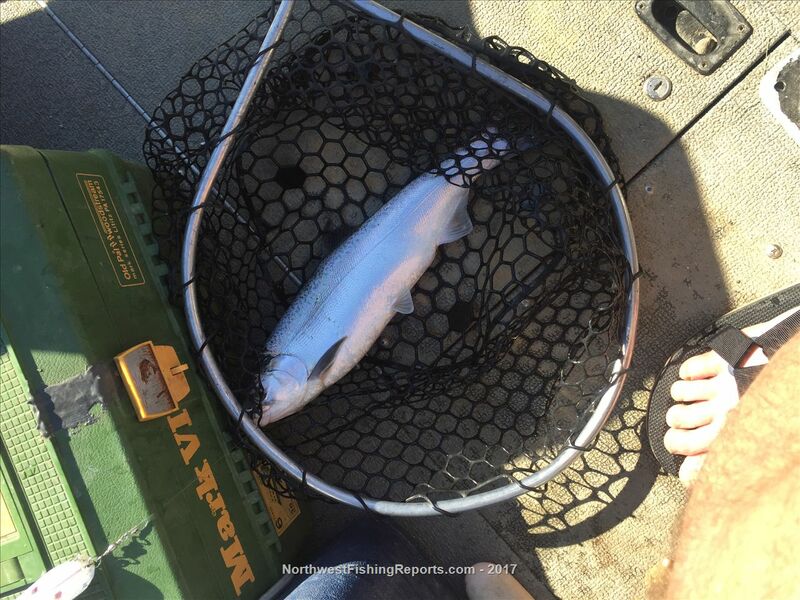 What depth were you fishing when you caught the chinook? I am headed that way on Sunday. Thanks for the report. All were in the 30-40 foot depth. I don't use a downrigger so it's an estimate.